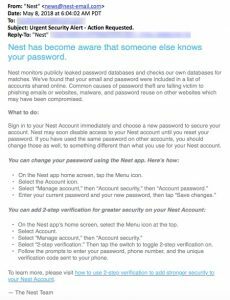 A colleague just received an “Urgent Security Alert – Action Requested” email from Nest. At first glance it looked like either a phishing attempt or one of the way-too-often breach notifications we all receive these days. Instead, it was a real alert notifying him that the password he uses for his Nest account had been compromised in a data breach – not at Nest but somewhere else. 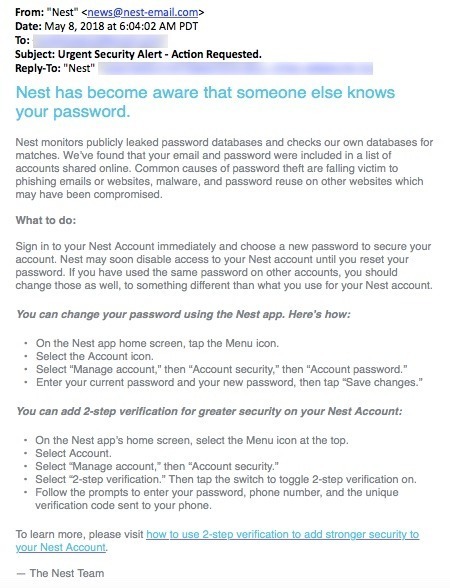 Nest encouraged him to update to a unique password and enable two-step verification (additional authentication beyond a password, usually referred to as multi-factor authentication). Read the Online Trust Alliance (OTA) IoT Framework.